Small paintings were once reserved for “lesser” subjects or denigrated as too commodifiable since their diminutive scale made them more accessible to the average consumer. But for many contemporary painters, a small canvas offers something often lacking in an age of immersive installations and Instagram-inducing shareable spectacles: intimacy. “As artists, we often obsess about the many and varied elements of our work. Everything from subject matter to color theory and paint handling come under close scrutiny. But there’s one aspect that many of us often overlook. . . size. Small, medium, or large, the dimensions we choose for our artwork will always have a tremendous impact on the effect it has on viewers. As a young artist in college I was obsessed with large drawings and paintings. I rarely worked on anything smaller than three feet, and many of my paintings were six foot or more in size. Like much of the art world I believed that “bigger is better.” I equated size to quality, personal expression, and impact. Over the years much has changed about my art making process. I’ve come to re-evaluate the “bigger is better” myth. In the process, my work has shrunk in physical size, but expanded in so many other ways. These days I rarely work on paintings larger than two or three feet in size and most of my work is 18″ x 24″ or smaller. Traditionally small paintings have primarily fallen into two categories: studies for larger works, or miniatures that are tour de forces of trompe le’oil painting technique. However, there are many artists who value smaller works as something more. As early as the 1880s, the noted artist Whistler executed scores of small oil-on-panel paintings, some as small as 3″ x 5″ which challenged the conventional wisdom that equated size with importance. One collector famously described Whistler’s small scale works as “superficially, the size of your hand, but, artistically, as a large as a continent.” More recently Ellen Eagle has earned quite a reputation for her diminutive pastel portraits. Today there are hundreds if not thousands of artists painting and exhibiting small works, including many artists like Duane Keiser of the Daily Painting movement that first inspired me to approach my body of small work in a big way. What I’ve learned is that larger formats can put distance, both physical and psychological, between the viewer and the art. While I adore those giant wall-sized Chuck Close paintings that can overpower a room, smaller sizes can allow for a more intimate interaction with the art by literally drawing the viewer in closer. There are actually many reasons why artists choose to create small paintings. Some artists cite the time factor. I can finish a small format painting each day and still have time to work on some of my larger pieces. Other artists who prefer to paint en plein air like working small because they’re just easier to carry. Painting small can also be a way to explore new techniques and experiment without the fear of using a lot of costly paint and canvas. My ability as a painter and my understanding of the medium improved dramatically when I began painting a lot of small pieces rather than concentrating on a couple large canvases. Whatever your reasons for painting small, there are a few challenges to overcome for those of us accustomed to larger formats. Often artists complain about feeling cramped or boxed in when working on a smaller canvas. This can cause a painter to tighten up, giving the work a stiff and lifeless feeling. Consider using large blocks of solid colors. Using large shapes and loose handling can help keep you from feeling “boxed in” or cramped in the smaller format. My painting The Rocky Shore contains very little in the way of details yet comes across as a realistic view of Lake Mineral Wells. The foliage is rendered in two or three large masses of color. The ripples of the waves are freely handled brushstrokes. I don’t try to indicate a leaf or a blade of grass. There’s really very little need to. Our vision is not merely a function of our eyes. When we view something our mind acts as a filter, interpolating and extracting much than our eyes can see. Just because the canvas is small doesn’t mean that the sense of scale and depth have to be small. I often use strong diagonals and foreground elements to create an larger sense of space. Frosted Field, above, is just 8″ x 10″ but it uses converging diagonals of a snow-covered plowed field to direct the viewer’s eye to a distant tree line, giving a sense of depth that isn’t constrained at all by the size of the painting. And it can work with offset angles, too. 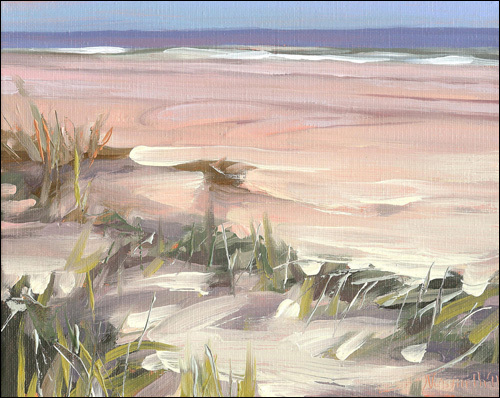 I added depth to my small painting Along the Beach with a strong diagonal of sea oats in the extreme foreground. A bit of aerial perspective, or the gradual shift in colors from warm to cool as they recede in space will also help to give an otherwise small scale painting a huge feeling of space and atmosphere. The smallest brushes I own are size 2, and most of my work utilizes size 4 rounds and flats or larger. Although my painting Clouds Over Galveston only measures 8” x 10” most of it was painted with size 6 and 8 bristle brushes. The clouds are formed from large, loose strokes of colors. Increasing the changes in color, value, and even the sizes and placement of forms can help give small paintings a more expansive feel. My 12” x 24” painting Early Morning at Caprock Canyon puts a darker, cooler foreground against a brightly lit background. I painted large bushes and tall grasses right at the bottom edge of the painting to give the impression of stepping into the landscape. There’s barely any physical space on the canvas between the foreground and the distant hills, but the overlapping strong contrast in value and color makes it seem like miles. Lastly, don’t think of your smaller paintings as studies for a larger piece. While it’s true that many small paintings may later be developed into a bigger work, try to think of your smaller paintings as complete and viable works of art on their own.